Craving plant-based comfort food? Try this Vegan Shepherd's Pie. Now, more than ever, the world needs comfort food. Enter Vegan Shepherd’s Pie. I actually made this recipe nearly two months ago. I’ve been meaning to post it but the timing never felt quite right. I can see now that I was saving it for a time when my country and the entire world desperately needs comforting. It feels even more appropriate to post today since this recipe has traditionally been considered “peasant food” and the global economy just took a dive. In these uncertain times, let us come together. Let us stand up and speak out for what we believe in. For women, for people of color, for animals, for the environment. We have to shine brighter, be better. For all of the hate and vitriol that’s being spewed, let’s meet it with love and determination to fight for a better future. Change has to come first from within. So today, I’m asking myself, what can I do? How can I improve? Who can I help? For starters, I believe we must first eradicate the belief that we are powerless. We are not. As a society, we have been asleep. But we’re awake now and we have work to do. Instead of binge eating vegan donuts and scrolling through Facebook in disbelief, I propose we turn our attention to spending time in the kitchen with our loved ones. Let us make food to nourish the soul and body from the inside out, like this Vegan Shepherd’s Pie. Hearty, savory Shepherd's Pie with a rich red wine gravy. Topped with creamy mashed potatoes for the ultimate plant-based comfort food. Dice the potatoes into 1/2 pieces. Place them in a medium saucepan and cover with cold water. Set over high heat, cover and bring to a boil. Once boiling, uncover, lower heat to a simmer and cook until tender and easily crushed with tongs, between 10 -15 minutes. Drain the potatoes and return them to the saucepan. Mash the potatoes and then add the non-dairy milk, vegan butter, salt and pepper. Keep mashing and stirring until smooth. Preheat the oven to 400 degrees F.
Make the filling while potatoes are cooking. Heat a pan on medium high, add the grapeseed oil. Add the onion and carrots and saute just until they begin to take on color, approximately 3 to 4 minutes. Add the garlic and stir to combine. Add the mushrooms, lentils, salt and pepper and cook until the mushrooms lose their moisture, approximately 5-7 minutes. Sprinkle the mixture with the chickpea flour and toss to coat. Add the tomato paste, broth, wine, vegan Worcestershire, rosemary, thyme, and stir to combine. Bring to a boil, reduce the heat to low, cover and simmer slowly 10 to 12 minutes or until the sauce is thickened slightly. Stir in the peas and corn if using, then transfer the filling to an 11 by 7 inch baking dish. Use a spatula to spread evenly. Top with mashed potatoes, being sure to create a seal around the edges to prevent the filling from bubbling through. Place the dish on a baking sheet on the center rack of the oven. Bake until the potatoes begin to brown, about 25 minutes. Let sit for 10-15 before serving. Swap vegan butter with cashew cream or olive oil if desired. Use GF Worchestershire to make this a gluten-free recipe. Recipe keeps in a closed container in the fridge for up to 5 days. 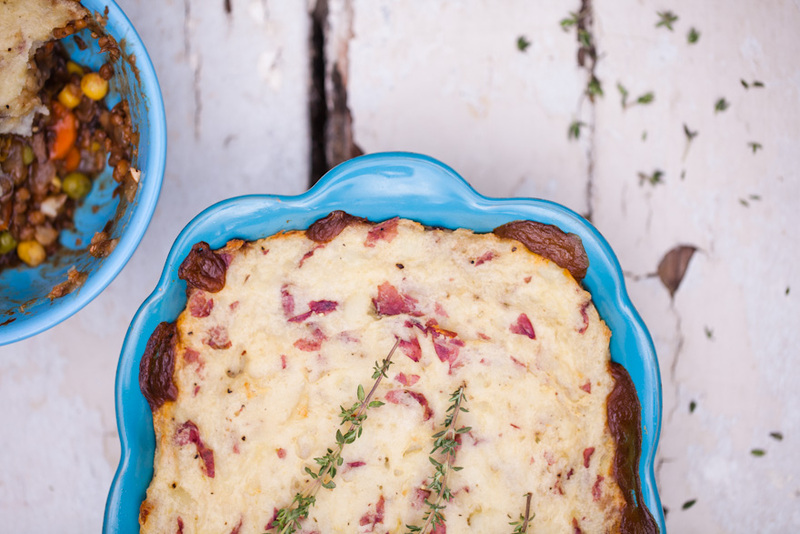 For more comforting plant-based recipes like this Vegan Shepherd’s Pie, check out our Chicago Style Deep Dish Pizza or our 20 Minute Cashew Cheese Quesadillas. Follow us on Facebook, Instagram, Pinterest, and Twitter so you never miss a post! To save this Vegan Shepherd’s Pie recipe for later, simply pin the photo below! Do you have ideas on how to strengthen our communities? Let’s start a conversation. We can build a better future together, I’m sure of it. This looks lovely. I am going to try it. Thank you. Seriously good! My family loved it! Thanks so much for the feedback Kelci! There is no indication of oven temp here. Hello! I’m going to make this tonight for dinner party. How many does this serve do you think.. I’m cooking for about 17 ahhhh scary! Hi Sabin! Just saw your comment! Hope your dinner party turned out well. This dish serves 4-6, depending on how hungry everyone is and what sides are being served. I recommend a big green salad and some crusty bread! Absolutely delicious!! Made this last night and will definitely be making it again!! Thank you!! Is there another flour I can use? I can’t find chickpea flour and it’s too late for me to order it online! Ty! Made the Shepherd’s Pie tonight. I didn’t get thirds because the rest of the family devoured the casserole. I’ll need to double up next time. It was a tasty, protein-packed dinner. HI. You mention to heat the grapeseed oil in the pan but there is no indication of the measurement? Just to mention but I don’t think Worcestershire sauce is vegan. Unless you can buy a vegan version I’m not sure. But I’m sure it’s delicious without and will be trying this tonight. Thank you!! Any good substitute for the tomato paste? I can’t eat any tomatoes. I would recommend using bbq sauce instead of tomato paste if you can have that. If not, I would simply leave it out and add a little extra wine for more flavor. It will still be very delicious! I made this today for Friendsgiving; very popular and I got requests for the recipe! I will make it again but maybe with a little more mashed potato topping.